I'm still on a break...between finishing 2012 with a bang and starting a new year of fresh ideas. I have plenty of those, but I'm resting up my brain so I can begin again at a fairly challenging clip, starting next week. That said, I'm still sewing. 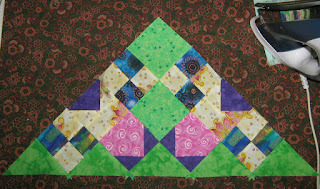 Four Pieced Block #Ones. Here are the first two, fresh off the assembly line. I love these colours! 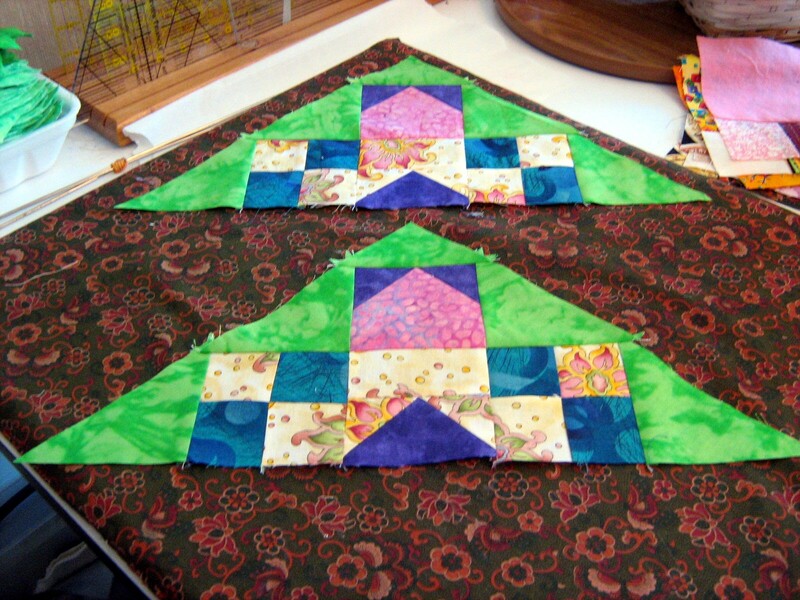 Eight (of 12) Pieced Block #Twos. Did I mention I love these colours?! I'll likely get the last four finished tonight. With each one, assembly becomes easier. The thing that blows me away, though, is how neatly the pieces fit together -- points, corners, the whole shootin' match. I've been doing these mysteries for the past two years because I know I'm going to need to retire some of my bed quilts from active duty, and have to replace them. However, what these have been doing for my piecing skills is nothing short of phenomenal. The fabric is from stash. The large print you see is a piece of the yard given me by my well-intended neighbours when I looked after their house last year while they were on an Alaskan cruise. They know I quilt and wanted to bring back something for me. Alas, they didn't realize how challenging it would be to use this piece effectively in a quilt. I hope to use the remains in a top (another Indygo Junction pattern). 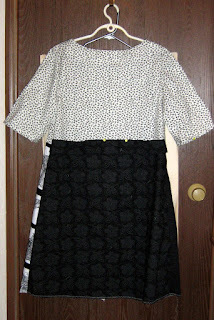 The back has a little faux belt, which will be secured by buttons, once I get the other handwork (hemming, tacking facings) finished. I have a large collection of buttons from which to select something fun and funky. 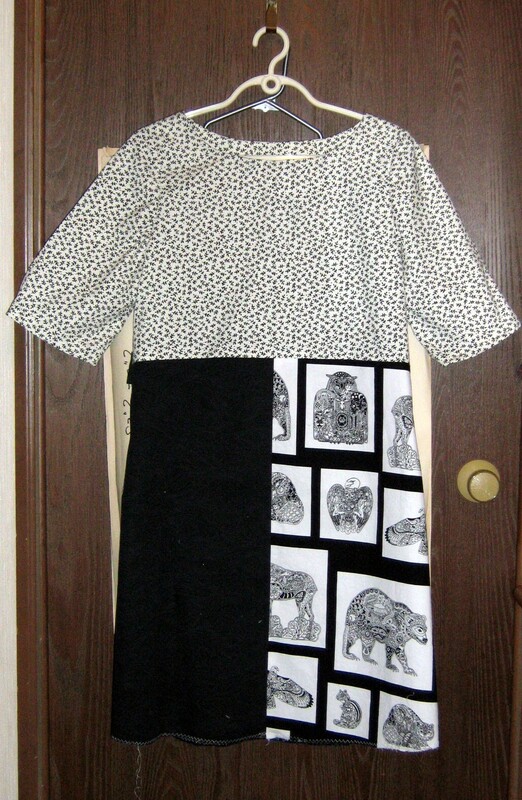 :-) The plan is to take this dress with me to Santa Fe in April. I haven't researched the weather there at that time of year. Given the altitude it could be very cool. Still, it's far south enough from Central Alberta that I can likely get away with a cotton dress on a museum tour at a luncheon (I'll be there for the SAQA Conference plus a couple of days beforehand for touring). And third...I succumbed to the temptation to purchase another Craftsy class. 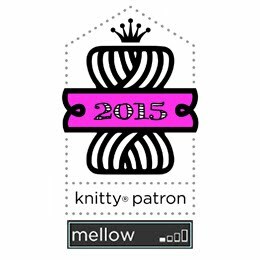 This one is "Design It, Quilt It" with Cindy Needham. 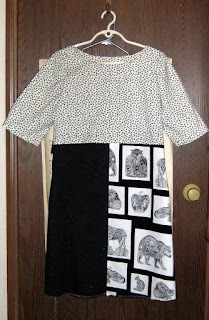 I've been following her blog for some time now and her quilting -- on a small machine -- takes my breath away. 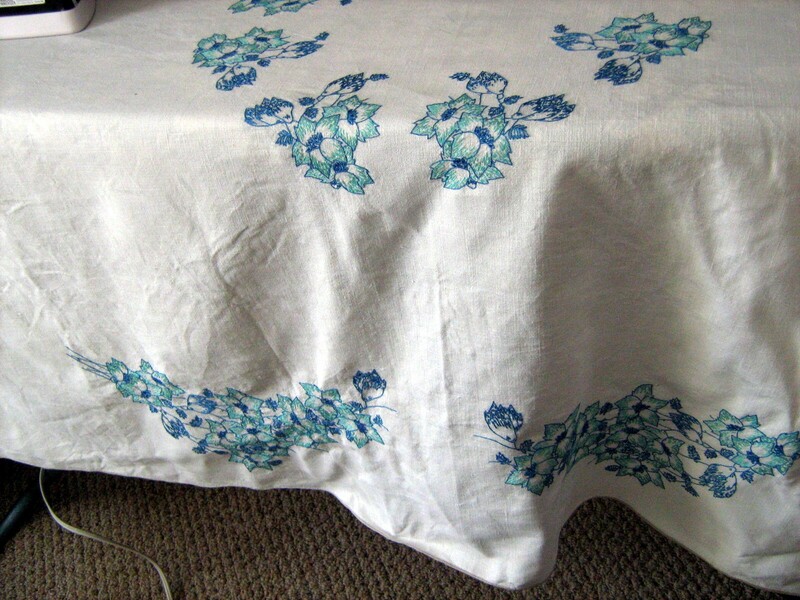 I have inherited several "vintage" cloths -- tea cloths, table cloths, tea towels, table runners -- from my mother/grandmother/aunt (the quilter), and while I use and enjoy a few of them, most of them are languishing in my linen closet because of the care required. Some are embroidered; some are cut-work; one or two are damask. I have it in mind to use a large tablecloth that graced our dining table for years when I was growing up, in some sort of tribute to my mother in time for the centenary of her birth in June 2016, and I think Cindy is just the person to teach me what I need to know to finesse this tribute piece. While the tea cloth is of a size suitable for a hanging, the table cloth, if quilted successfully, could actually be a throw or small bed quilt size -- or a very large hanging. We'll see what transpires as I go along. To add class work to my list of projects (again) requires some planning and a likely re-jigging of my "sewdio" time table...so stay tuned! And now I'm going to head back to the machine to finish the last four pieced blocks for ES Clue #7...and will link this post up to WIP Wednesday at The Needle and Thread Network. Nice blocks and you have a great plan. I like 'sewdio'! I love your blocks and the colours. I'm totally in love with your vintage tea cloths and table cloths. What a wonderful idea. Good luck in 2013. Those blocks are great, wonderful colours. 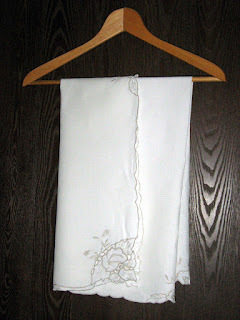 Great idea for the vintage linens (lucky you to have stitchy ancestors). Easy street is looking good Margaret...gorgeous colors. What a fun dress! I went to a talk by Cindy Needham some years ago where she showed her work...lovely.